With every passing day, the Fed is slowly but surely losing the game. Only it is not just former (and in some cases current) Fed presidents admitting central banks are increasingly powerless to boost the global economy, even if they still have sway over capital markets. What is far more insidious to the Fed’s waning credibility is when former economists affiliated with the Fed start repeating mantras that until recently were only a prominent feature in the so-called fringe media. This is precisely what happened today when former central bank staffer and Dartmouth College economics professor Andrew Levin, special adviser to then Fed Chairman Ben Bernanke between 2010 to 2012, joined with an activist group to argue for overhauls at the central bank that they say would distance it from Wall Street and make its activities more transparent and accountable to the public. Levin is pressing for the overhaul with Fed Up coalition activists. Many of the proposed changes target the 12 regional Federal Reserve Banks, which are quasi-private and technically owned by commercial banks in their respective districts. All of that is not surprising. What he said to justify his new found cause, however, is. Why is that stunning? Because it has long been a bone of contention if only among the fringe media, that at its core the Fed is merely a private institution, beholden only to its de facto owners: not the people of the U.S. but to a small cabal of banks. Worse, the actual org chart of who owns what is not disclosed, even as the vast majority of the U.S. population remains deluded that the Fed is a publicly owned institution. As the WSJ goes on to note, the former central bank staffer said he sees his ideas as designed to maintain the virtues the central bank already brings to the table. They aren’t targeted at changing how policy is conducted today. “What’s important here is that reform to the Federal Reserve can last for 100 years, not just the near term,” he said. And this is coming from a former Fed employee and Ben Bernanke’s personal advisor! That in itself is a most striking development, because now that the insiders are finally speaking up, it will be a race among both current and prior Fed workers to reveal as much dirty laundry as possible ahead of what is increasingly being perceived by many as the Fed’s demise. To be sure, Levin’s personal campaign for Fed transformation will not be easy, and as the WSJ writes, what is being sought by Mr. Levin and the activists is significant and would require congressional action. Ady Barkan, who leads the Fed Up campaign, said the Fed’s current structure “is an embarrassment to America” and Fed leaders haven’t been “willing or able” to make changes. Specifically, Levin wants the 12 regional Fed banks to be brought fully into the government. He also wants the process of selecting new bank presidents—they are key regulators and contributors in setting interest-rate policy—opened up more fully to public input, as well as term limits for Fed officials. This would represent a revolution to the internal staffing of the Fed, which will no longer be at the mercy of its now-defunct shareholders, America’s commercial banks; it would also mean that Goldman Sachs would lose all its leverage as the world’s biggest central bank incubator, a revolving door relationship which has allowed the Manhattan firm to dominate the world of finance for the decades. Levin’s proposal was made in conjunction with the Center for Popular Democracy’s Fed Up coalition, a group that has been pressuring the central bank for more accountability for some time. The left-leaning group has been critical of the structure of the regional banks, and has been pressing the Fed to hold off on raising rates in a bid to make sure the recovery is enjoyed not just by the wealthy, in their view. The proposal was revealed on a conference call that also included a representative from Bernie Sanders’s presidential campaign, although all campaigns were invited to participate. The WSJ adds that according to Levin, who knows the Fed’s operating structure intimately, says the members of the regional Fed bank boards of directors, the majority of whom are selected by the private banks with the approval of the Washington-based governors, should be chosen differently. The professor says director slots now reserved for financial professionals regulated by the Fed should be eliminated, and that directors who oversee and advise the regional banks should be selected in a public process involving the Washington governors and local elected officials. These directors also should better represent the diversity of the U.S.
Levin also wants formal public input into the selection of new bank presidents, with candidates’ names known publicly and a process that allows for public comment in a way that doesn’t now exist. The professor also wants all Fed officials to serve for single seven-year terms, which would give them the needed distance from the political process while eliminating situations where some policy makers stay at the bank for decades. Alan Greenspan, for example, was Fed chairman from 1987 to 2006. As the WSJ conveniently adds, the selection of regional bank presidents has become a hot-button issue. Currently, the leaders of the New York, Philadelphia, Dallas and Minneapolis Fed banks are helmed by men who formerly worked for or had close connections to investment bank Goldman Sachs. Levin called for watchdog agency the Government Accountability Office to annually review and report on Fed operations, including the regional Fed banks. He also wants the regional Fed banks to be covered under the Freedom of Information Act. A regular annual review hopefully would insulate the effort from perceptions of political interference, Mr. Levin said. While ending the Fed may still seem like a pipe dream, at least until the market’s next major crash at which point the population may finally turn on the culprit behind America’s serial boom-bust culture, the U.S. central bank, Levin’s proposal would get to the heart of the most insidious conflict of interest in the US: the fact that the Federal Reserve works not for the people of America, but for its owners – the banks. Which is also why, sadly, this proposal will be dead on arrival, as its passage would represent the biggest loss for Wall Street in the past 103 years, far more significant than anything Dodd-Frank could hope to accomplish. CitiGroup: The End of Pax Americana, With No Replacement in Sight. Just a few days ago, CitiGroup released a new report that reads like an alarm klaxton sounding the end of the current geopolitical world order, with nothing but chaos to follow. Indeed, the “banksters” are admitting that everything we thought we knew about how the world operates is either wrong, or coming to a jarring end. The report is centered around the idea that “Pax Americana” has either already ended, or is in its final death throes. “Pax Americana” is the term often used to define the (previously) current geopolitical order. That the general peace and stability of the Post-WWII world is due to America’s dominant economic and political power, backed up by its ridiculously large military. In its analysis, Citi is certain that the Pax Americana era is over, but the main problem for the future is what they’re calling the “Great Power Sclerosis.” In other words, there’s nothing to replace Pax Americana, other than chaos, disorder, and a great many panicking investment bankers. The full PDF of the report, “Global Political Risk: The New Convergence Between Geopolitical and Vox Populi Risks, and Why It Matters” is available here, and I encourage all to take the time to read its 70+ pages. Because, there are times when the pragmatic warnings, predictions, and fears of those advising investors are very important to we, the skeptical. This is most certainly one of those times. 2016 has begun, as 2015 ended, amid a significant worsening of the global political climate and along with that, considerable volatility in financial markets. Investors and businesses are increasingly aware of the need to understand the drivers and the implications of a greater level of event risk exacerbated by shifting social patterns. Well, tell us something we didn’t know. In other words, translated from investor-speak; put on the air mask and assume crash-landing position. In our view, political and business leaders will need to be more attuned to the new shape of global political risk, a paradigm shift that means that previous policies will fail to keep pace and uncertainty will remain high, with the potential to interact in unexpected ways. Among the key implications of this more fragile and interconnected risk outlook is that so-called Black Swan events — in this case, geopolitical events producing instability spanning several orders of magnitude — may be both more likely and more difficult for leaders and global financial institutions to resolve. The Black Swan theory was developed by Nassim Nicholas Taleb, as the disproportionate role of high-profile, hard-to-predict, and rare events that are beyond the realm of normal expectations in history, science, finance, and technology. The 9/11 attacks are a prime example of a Black Swan. Over the long-term, failure to devise policies to address middle class anxiety and declining living standards increases the likelihood that Vox Populi risk — including mass protests and government collapses — could move from being episodically disruptive to systemic, undermining globalization in the process. And we are deeply concerned that the political capital necessary to stem the refugee crisis and terrorist threat, perhaps best-characterized as the collision between previous foreign policy failures and current governance capacity, exceeds that available to government leaders, who have relied upon central banks to manage the lion’s share of global crises over the past several years. 2016 could be a very political year for markets. Overall, the report is an excellent analysis of the condition our condition is in, which isn’t good by any measure. It’s very enlightening read, and worth your time. Stagnant. That’s the word that best describes our economy over the last 6-7 years from the 2008/2009 recession. Too many people point to the stock market as an indicator of economic health. Some of you reading this may still do that, while many others have wised up and realize it’s nothing more than gambling – mainly for the rich. This is why I focus on Wages, Jobs, and Sales. These three factors give you a better picture of the millions of Americans that haven’t invested much (if any at all) in the stock market. According to the most recent September 2015 Census Bureau report 2014 wages have been stagnant and are in fact down from 2007 (pre-recession). You find that for 2014 average wages are not statistically significant from 2013 wages, and 2011 and 2012 saw declines in average wages. So, average wages (for everyone) have declined and now flattened out but are still not where they were prior to the recession – 6.5% lower 2014 vs. 2007. If you are Asian, good news – your average wages are higher than any other race. If you are white, also good news, you make the 2nd highest average wage. If you are black you make the lowest average wage and hispanics follow right behind. More importantly the average wage for non-whites (asian, hispanic, black) had no statistically significant change from 2013 to 2014. However, the bad news for this same period whites saw a 1.7% decrease in average wages. As an economist, this is one of my most hated statistics reported. Unemployment numbers are only based on people (age 16+) actively looking for jobs (last 4 weeks). People that give up on looking for jobs aren’t included in this statistic. It’s important to understand that the BLS (Bureau of Labor statistics) attempts to track people in the “Not in Labor Force” (NILF) and they also have “Marginally Attached Workers” (MAW) and “Discouraged Workers” (DW). Both the MAW and DW groups (age 16+) are NOT included in the unemployment figures because they have not actively looked for work in the last 4 weeks. To get a better understanding of what has really been happening (because a picture is worth a thousand words) I’m including two recent graphs from the BLS website. As you can see the unemployment rate is indeed dropping. But of much more concern are the growing number of people that are NILF because they have given up. This paints a much more bleak picture of our economic conditions than the simple unemployment rate provides. 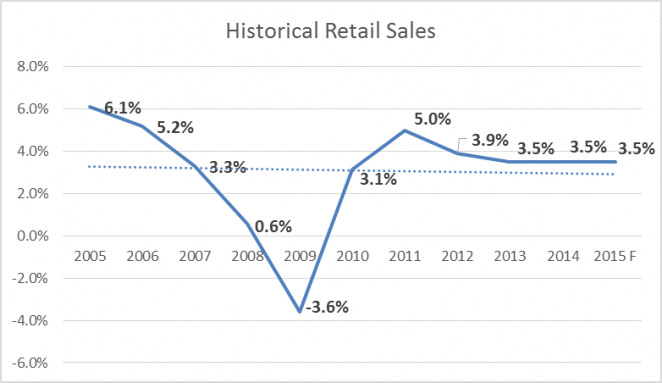 In February 2014 the National Retail Federation (NRF) provided a forecast that retail sales were expected to grow by 4.1% over the next year (LINK). However, by July 2015 they had to adjust their forecast downward to 3.5% (LINK). Reference for this graph is at the NRF website, LINK. Add to that the stock market is moving into a much more volatile time period and there are continued restructuring (layoffs) in many industries around the world to save those companies money (Hewlett Packard, Catepillar, ConAgra, Walmart, Target, Air France, etc.) and we might be missing some signaling of things to come over the next 1-3 years. Wal-mart stock price plummets and the billionaire heirs lose in the neighborhood of $9-11 billion in one day, Bloomberg. I can tell you this, any restructuring they do is going to preserve their own greedy pockets not those of the average worker. I’m expecting to see dips in the markets Mid-November into Mid-December (approx. Nov. 17 through Dec. 20). And again market dips in the Spring of 2016 Mid-April to Mid-May. The downward trend will continue as we move more toward a new paradigm, yeah I said paradigm because that’s the best way to describe it at this point. It’s time to begin imagining and possibly implementing a better system. Complaining and pointing out the faults of the broken system that we have only goes so far, we must begin. Is the stock market going to crash by the end of 2015? Of course stock market crashes are already happening in 23 different nations around the planet , but most Americans don’t really care about those markets. The truth is that what matters to people in this country is the health of their own stock portfolios and retirement accounts. There are a lot of people out there that are very afraid of what could happen if the money that they have worked so hard to save gets wiped out in a sudden financial collapse. And right now there is an unprecedented amount of buzz about the potential for a giant stock market crash by the end of this calendar year. In fact, I don’t think that I have ever seen more experts come out with bold predictions that a stock market crash will happen within a very specific period of time. 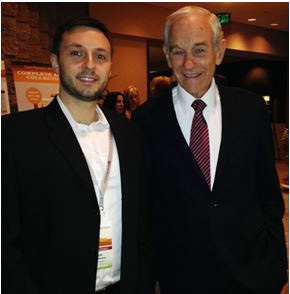 -Harry Dent recently stated that we are just “weeks away” from a “global financial collapse “. -Gerald Celente says that “the global economy has collapsed ” and he is “predicting that we are going to see a global stock market crash before the end of the year “. -Jeff Berwick, the editor of the Dollar Vigilante, says that there is “enough going on in September to have me incredibly curious and concerned about what’s going to happen “. -Egon von Greyerz recently explained that he fears “that this coming September – October all hell will break loose in the world economy and markets “. -Even the mainstream media is issuing ominous warnings now. Just a few days ago, one of the most important newspapers in the entire world published a major story about the coming crisis under this headline: “Doomsday clock for global market crash strikes one minute to midnight as central banks lose control “. The BIS  warns  that the world is currently defenseless against the next market crisis. I would point out that the BIS has a record of predicting economic crashes, including back in 2007  just before the derivatives and credit crisis began. This ability to foresee fiscal disasters is far more likely due to the fact that the BIS is the dominant force in global central banking and is the cause of crisis, rather than merely a predictor of crisis. That is to say, it is easy to predict disasters you yourself are about to initiate. Back on June 25th, I issued a red alert for the last six months of 2015  before any of these other guys issued their warnings. Well, here we are just a couple of months later and all hell is breaking loose. 23 global stock markets are crashing , the price of oil has been imploding, a new currency war has erupted , industrial commodities are plunging just like they did prior to the market crash of 2008 , a full-blown financial crisis has gripped South America with fear , and junk bonds are sending some very ominous signals . In the U.S., things are beginning to slowly unravel. The Dow is now down over 1200 points from the peak of the market. At this point, it isn’t going to take much to push us into a bear market. Most of you probably already know a good chunk of this, but for those of you who don’t, here’s the breakdown. The last two days have gone down in history as larger than any single day stock market crash in history. Thousands of news articles are going up everywhere, anybody important has already pulled everything out of the NYSE, and other investors are still pulling, and pulling from other stocks too. Walmart’s stock alone has dropped nearly 5 percent which blew my mind when I saw. I used to work for that company. But upon seeing a random comment on the Internet where this dude pretty much laid out everything that’s happening in the bigger picture (which I will paste at the bottom of this post) I decided to look into things a little more deeply. I found that there will be another stock market crash. The motives and implications are a little fuzzy, but here’s what I do know. Keep in mind that the conspiracy is almost certainly much larger than the information i’m posting here and also I will be posting google search terms instead of links because I don’t want to post a bunch of links only to realize i’m breaking a rule and have my post removed. Furthermore some simple Googling will bring up articles of people knowing about China’s stock market crash for years. Not to mention Greece’s recent crash. And now America. This can’t be a coincidence. People have known about these things for way too long, have had time to prepare for it or avert it entirely, but it all happened anyway and is continuing to happen. Who’s next, Australia? Is this bigger than Donald trump? Who knows, we’ll just have to keep our eyes open. And last but not least, here’s the original post from Google+ on The Free Thought Project page. Please excuse the bad grammar, it was obviously written in a hurry. For once pretty much everyone here is in agreement and we all have our own particular areas of concern. Overall though we agree. Now is what will happen some Monday soon. There will be a horrible stock market crash. A big crash just like last time but worse, much worse. There will be bad repercussions all through the world and here in te USA. It will make Bernie Sanders look like a deer caught in the headlights and Donald Trump look good to a worried “We need a business genius NOW” population.DON”T BE FOOLED!!! It is a set up by the FED to 1). Ensure the outcome of the next election and @). To get te USA involved in a Huge war, perhaps a world war, to bail out our economy and give the finger to China who holds a lot of the debt. The FED is a private Bank owned by Pro Israeli world class financiers who want to enslave us to debt (to them) and who own all the business devoted to war and a war economy. They want to make sure we are fully engaged, not this petty war on terror [censored for ATS], a real shooting deadly outcome war. Don’t be fooled, Fight the FED Fight the Republicans and Fight to keep your rights under the Bill of Rights and the Constitution, they are being undermined with the excuse of National Security.It is a lie. Stop this , do not participate , become active and engage in massive civil disobedience if what I say comes true. If it turns out I am a whacked out crazy prognosticator of wild eyed Henny Penny false alarms, then I am an idiot and you were right to sit back and go on as if nothing is messed up. Still – – – Remember Monday there will be a stock market crash, a really big one. Perhaps it will happen on a Friday but more likely on a Monday, Mark my words, it is planned and you are not in on the benefit plan from it. Related ATS Thread :Has anybody noticed the U.S. stock market decline?